Sorry about the lack of updates. Been prepping a final Master's thesis presentation which happened today. I am officially done with school for good (at least the student aspect....) Found a few friends playing Race For The Galaxy at the Uni right after and played a couple rounds. What a great way to relax after three years of stress. Heading home to BC tomorrow night and plan to grab a suitcase full of my old games to bring back with me. Can't wait. May be short on updates for a couple weeks while I'm away. 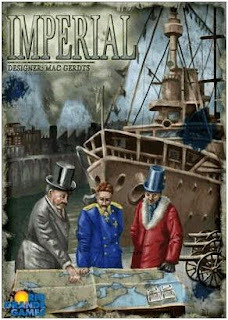 Got a chance to play a game of Mac Gerdts' "Imperial" last night and I must say I was impressed. This game has been very highly rated on BGG and the lovely Rondel mechanic has been mentioned time and again and rehashed in other Gerdts games like Hamburgum. So why did it leave such a good impression? Firstly, the components. Big colourful board, great wooden pieces, and large heavy cardstock for the bond markers. All the colours were very distinct which my colour-blind self always appreciates and it seems like a game that will last a very long time. The rules, though, seemed rather confusing but I think that just may have been the person explaining them. The player reference cards helped a lot and I expect by our second game they won't be necessary. Speaking of rules, I will readily admit that this game is complex. I will not get into a full rules explanation here but I will say that they are logically implemented and ridiculously elegant once grasped. That said, we were in a complete fog through the first half of the game until we'd seen how everything starts to play out. So what really happens? Well, there are six countries none of which are owned by any single player and bonds for each of the countries. The players invest in the various countries and the person with the most bonds at any given time for a certain country makes all the decisions for that country. So there are really two games going on: a Diplomacy style wargame (w/o the diplomacy, which is fine by me) and an Acquire style investment game. The countries build up armies, conquer lands, and tax these lands to earn money and points to increase the bonds of their investors. And the investors (players) buy bonds in the different countries and earn money off the interest paid by the countries amongst other things. Tying this all together is a simple circular mechanism called the "Rondel". The Rondel contains all the different options for a country: build factories, produce armies, tax lands, maneuver (conquer lands), and allow investors to buy. A country, controlled by a player, can only move up to three spaces for free limiting its choices greatly in the early game. This makes most turns lightning fast which is fantastic! It also provides a good ebb and flow to the game as investments seem to come all at once and then lots of maneuvering by countries and back and forth. It's really quite brilliant and must be played to be fully appreciated. There are a LOT more details which I will leave out here but once grasped the game seems to find a rhythm and strategies do emerge. One thing did bother me about the rules, though, and this was the Investor card. At each Investment turn usually only one person gets to invest, the one holding the Investor card. The card then moves clockwise to the next person who buys during the next investor round. Well, at the end of the game two of us didn't get as many investor rounds as the others so we had one less opportunity than everyone else to purchase bonds. Considering how big the investments were near the endgame, I think this may have cost me the game. Our scores in player order were 104-109-116-104-82, I think. It was really close and if I had one more buy, I wonder if I could have gotten my 104 to 117. Quite possible. Of course this is where ending the game early could secure you the win but I don't like when people aren't on even footing. I'm curious to hear what others thoughts are about this and to try the No Investor variant. Having said all that, I thoroughly enjoyed this game. I won't get to play it much because my game group hates complex 3 hour brain-burners. But for me, it was a brilliant mix of wargame and Eurogame that seemed to succeed wildly on both fronts. It plays unlike anything I have tried and most turns speed along at a good clip even if you don't control any countries at the time. 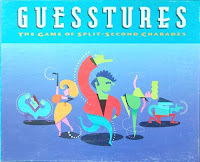 I mentioned Acquire earlier but that may not be the best analogy - this game plays more like a cross between Chicago Express and Diplomacy w/o the diplomacy turns. Great, great, great. So I've played a few games of Le Havre now and it is really growing on me. The strategies are subtle and numerous. Managed to play a couple rounds of Race on Wednesday night. I still quite enjoy the play of the game but the subtleties have stopped emerging for me. That night I did well the first round and won the second but I always just end up playing the colours game. First round I got New Sparta so I just started collecting more and more military. Got the military bonus cards and scored pretty big. Second round got some green planets with shipping so I just started collecting green bonuses with the contact specialist. Won that one, too, thanks to some huge green 6-dev cards. I dunno. I seem to have hit a wall with this one. It's fun so I'll happily play it but I find so much depends on the cards you draw and I think I had a lucky night. Or maybe we're just hooked on Dominion now and RFTG has lost its glow (although they are pretty different). So I made the friends we always play Dominion with buy the copy of Intrigue. Makes sense that they would own it so we could play at either place. We got three games in the other night and I must say that despite its issues, it is quite the improvement! I love the choices the new cards give (see here to take a look at the new cards) . Play of the hand is much more subtle and enjoyable but still relatively fast-paced. The interaction is much stronger and way more vicious which makes for a great game. The Saboteur is brutal beyond words and the Swindler seemed pretty nasty as well. So the new action cards really jack up the nastiness (although the Torturer seemed pretty weak). As well, there are now victory cards that double as action cards so suddenly you aren't filling your deck with useless crap when you buy points. I like that. The Great Hall seems like a must buy no matter what. There are some issues, though. Certain cards seem like original Dominion action cards for the same price but with a slightly better action. Take for instance the Ironworks. It's basically the Workshop with a bonus of card, action, or coin. This means if we combine both sets and these two come out, the Workshop will be useless. I don't like that. This is only the second expansion so you'd expect the card choices to still be fairly distinct from the originals. As I mentioned previously, I am finishing up my Master's thesis this week and although it is going well, I find I need to take a lot of short breaks away from writing. 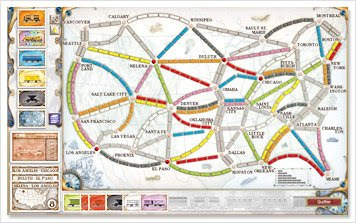 One of my great reliefs and/or distractions has been TTR Online. 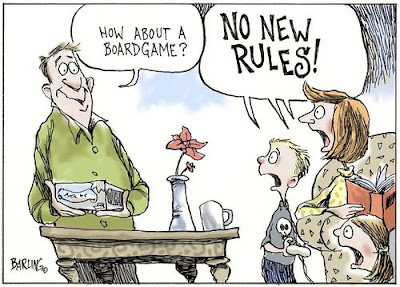 I am a massive fan of the board game, having 5 editions, and love that I can play a round online in 10-20 minutes. Many people don't realize that if you own a TTR edition there is a code in the rules book that let's you sign on and play for free. I just can't seem to get sick of this game, live or online. The only drawback to online is that they don't have my two favourite maps, Germany (Marklin) and the Nordic Countries. Maybe they'll bring in Nordic soon as it's such a great 3-player game. Sidenote 1: Played Le Havre finally. Good game but quite long. Easy to explain, hard to figure out. I imagine it will grow on me quickly. I want it, I want it, I want it! Well, it looks like they are releasing a big expansion, called the Ystari Box, with new bits for six of their games. I am particularly excited about getting my hands on the Nile expansion for Mykerinos, which was only previously available at conventions. Adding a river and another character to that game will be fantastic. Quick one today (still trying to finish thesis!). I am in the final throes of my master's thesis (one week to go!) and not only am I not playing many games but I can't really afford to buy many games. Ugh. 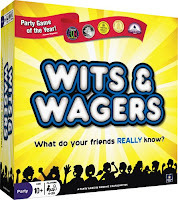 I walked into my FLGS and stared longingly at the 63 dollar "Le Havre" box knowing I only had enough to purchase "Wits & Wagers" for 30. Sigh. I have a dinner party to go to tomorrow so that's a reasonable excuse, I guess, to buy yet another game. Thank goodness my neighbors are buying Dominion: Intrigue. Don't think I could wait until my new job starts in September to buy and play it... On the plus side, I'm heading home to BC the beginning of August and I always bring an empty suitcase when I go. The majority of my old collection (including Union Pacific and Samurai) is stored there in a friend's basement so I always come back to Ontario with a suitcase full of great games just aching to be played again.